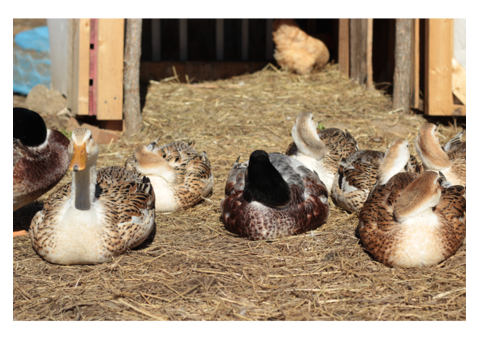 Description: Duck Dance Farm is a conservation, demonstration, and educational family farm, whose primary mission is the preservation of endangered breeds of duck. This spring we are hatching a variety of ducklings, including: Silver Appleyard Miniature Silver Appleyard Ancona Welsh Harlequin Saxony Khaki Campbell All of our ducklings are ~10500Ɖ ($8) a piece the first week they are born, and go up in price as they age to adulthood. Please contact us (duckdancefarm@gmail.com) to check availability of ducklings, as we sell out quickly and hatching rates vary. We do not ship ducklings, so you must be willing and able to come pick them up. We also have duck eggs available most of the time. These are ~7800Ɖ ($6) a dozen. Our farm also frequently hosts classes, taught both by our farmers and by teachers from around the area. For more information about classes please go to www.duckdancefarm.com/events Tours of the farm are always available for ~6500Ɖ per person. Group rates also available. Please contact us in advance if you would like to come for a tour. We are happy to accept Doge, as well as other leading cryptos, in exchange for all of our products and services here at Duck Dance Farm, and hope to see you soon!